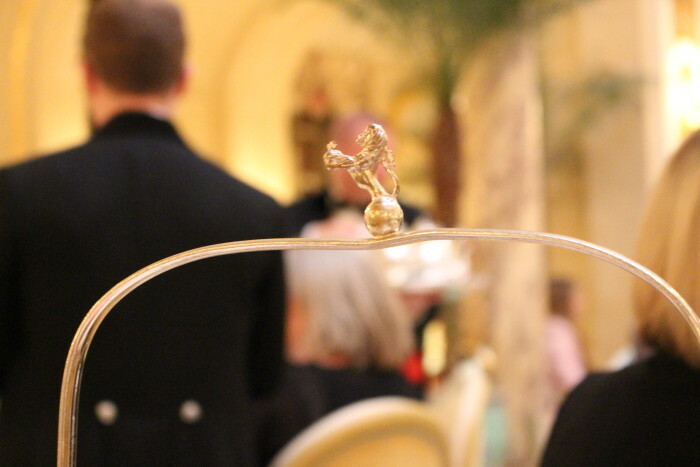 Just check out the gilt detailing, the marble and sparkling chandeliers. Looking down the gallery hallway from the lobby. The Palm Court is on the left. The piano on the right. 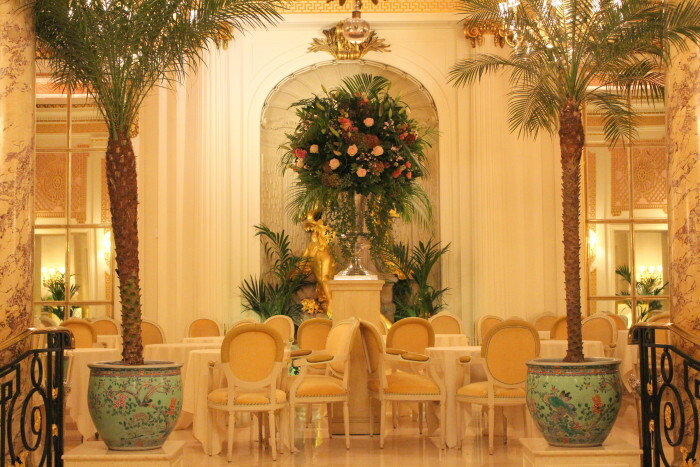 There are real palm trees at the entrance to the Palm Court where afternoon tea is served. Reservations are a must as they fill up well in advance. 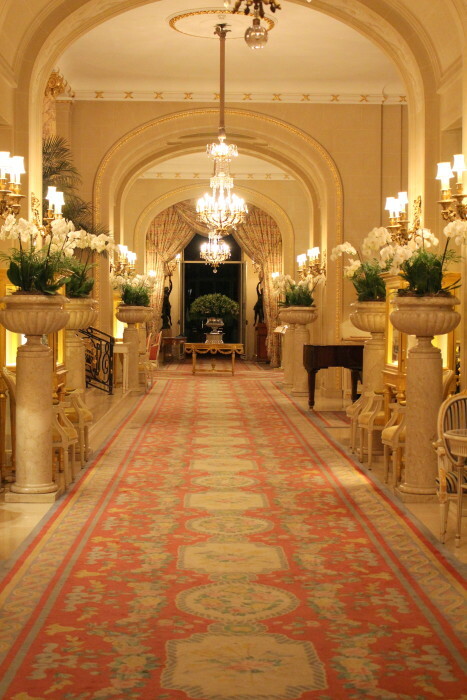 The room has a soft apricot glow while the mirrors and gold detailing add sparkle and twinkle. The towering floral arrangement is the star of the room. Look up. Opulence is everywhere, even on the ceiling. 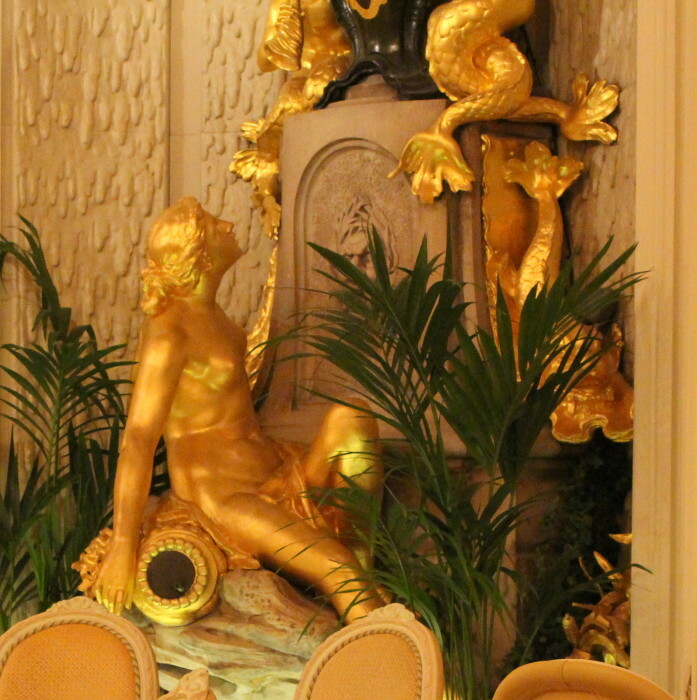 Gold statuary in an alcove along the back wall. Detail of the woman collecting water at the fountain. Now that you’ve seen the place let’s go in and have tea, shall we? 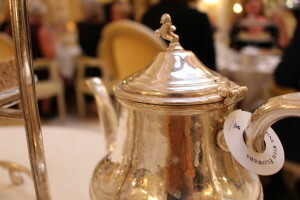 The Ritz has a dress code policy throughout the hotel and tea is strictly coat and tie. I’m so appreciative to my non-coat-and-tie-wearing husband for putting on the required duds and accompanying me. Here is the table setting when we sat down. The flowery china is a pattern made by Royal Worcester exclusively for the Ritz – London. Yes, I turned it over and looked. 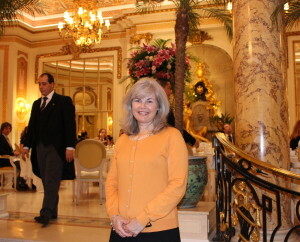 It is pretty but it seemed totally out of place and just didn’t match the ornate, over-the-top decor. Instead, this pattern looks a little frou-frouey like Grandma’s china set. There’s nothing wrong with Grandma’s china; it just belongs in Grandma’s house. The two canisters contained clotted cream and strawberry jam. The clotted cream looked like it had sat out for too long because the surface had hardened up and turned color. 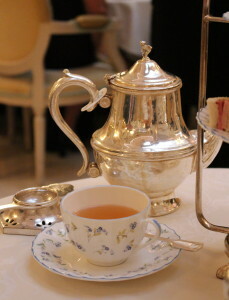 I had the Jasmine with Flowers green tea and my very tolerant and supportive husband had the Darjeeling. Initially these teas were delightful and I enjoyed the black Darjeeling and the lighter green tea but because the tea leaves were steeping directly in these big pots, halfway through our afternoon tea experience both teas became undrinkable. The tea became dreadfully bitter from this oversteeping. You just can’t drink it fast enough to prevent this unfortunate outcome. Other places have this problem figured out. At the Peabody, they used much smaller pots and just kept refilling with hot water. That’s why they had the second pot with hot water for refills at Bettys. It would be better to only use these large pots when serving multiple people because they are too big for one person. Our three tiered service came out with just two plates; sandwiches and desserts but no scones. This was very odd. I’ve never seen this before and just assumed that the scones weren’t ready. However, I’ve since done some research and I found that this is their standard practice. I can’t figure out why you’d bring out a three-tiered server with only two plates on it. Sorry for the list but it is taken directly from the menu and I wanted you to see how they wrote it up. I’ll credit them for hitting all the classic tea sandwiches but it sounds boring, doesn’t it? It looks boring too and I hate to tell you that it tasted boring. Seriously? Ham on white bread? A plain cheese sandwich? Egg salad on white bread? I could’ve made all those sandwiches in my kitchen with very little effort. It’s like they weren’t even trying. 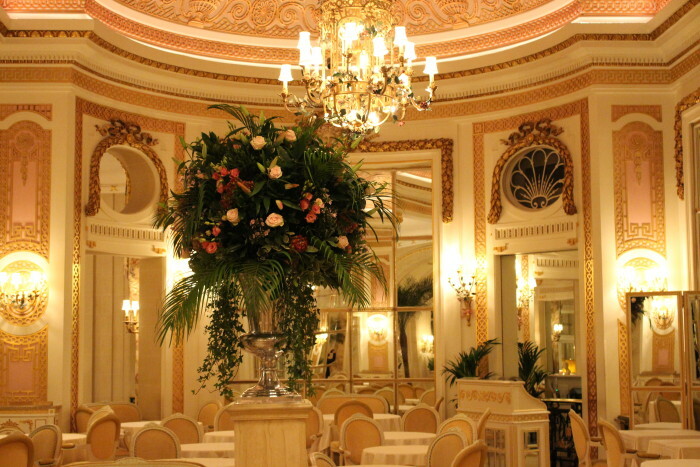 Just compare this to what we had at the Ritz in Atlanta or look again at my post on the Peabody in Memphis or the Palm Court at the Balmoral Hotel in Edinburgh. Light years ahead of the Ritz in London. The sweets on the three-tiered server consisted of a hazelnut cake, tiramisu creme puff and macarons. Pretty enough but I didn’t care for them. I’m not a fan of macarons or tiramisu either since I don’t like the taste of coffee. I’m sure someone else would have enjoyed them. Nothing wrong, it’s just not to my taste. Note that the handle on the server was bent. I did. After a while the scones showed up. They were bland and tasteless. 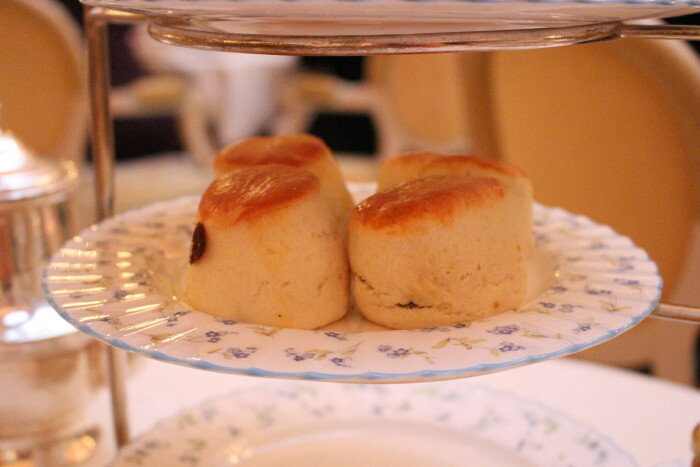 Your average locally owned tea room makes much better scones than these. I’d take the chocolate cherry scones at Burdett’s Tea Shop & Trading Company over these any day. At the end of our tea our waiter, Sebastian, brought a dessert trolley around with more sweets to choose from. 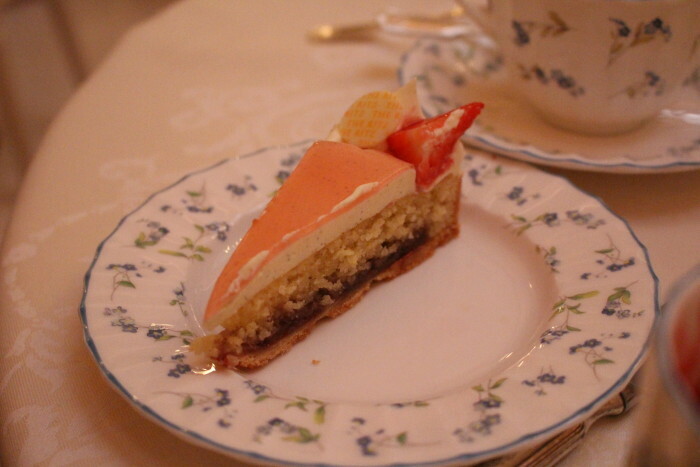 We selected the Strawberry Tart Cake. It was pretty but the taste fell short. Overall I was disappointed. 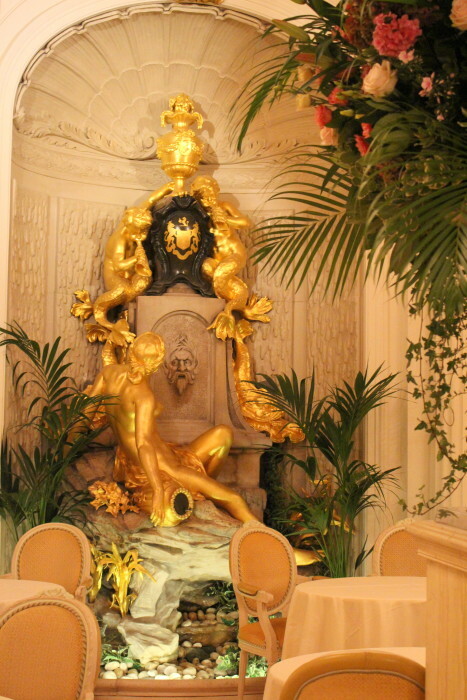 Even though the Palm Court was very posh, all the gold and glitz was so overdone it became a bit garish. You could even say it was old and tired. The table setting was trite. Worst of all the food was mediocre and without flavor. It could have been made in a cafeteria. The one bright spot was the friendly service. It just felt like a tourist trap and I’ll present evidence for that in my next post. 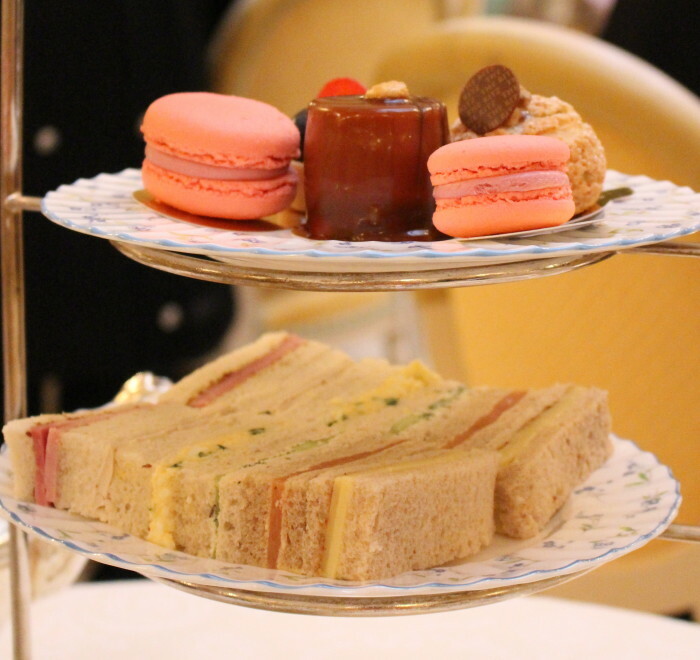 If you’re in London and you want to experience a lovely afternoon tea, skip the Ritz. Save your time and money. 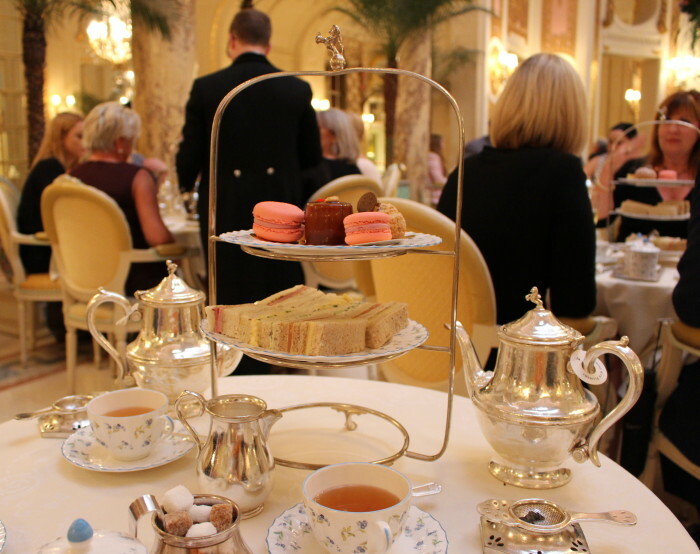 I preferred the Savoy or even tea at Harrods department store – it’s much more reasonably priced. I’ve also heard good things about Claridge’s and Fortnum & Mason so I’ll give them a try next if I get the chance.